Tile of Spain, the international brand representing 125 ceramic tile manufacturers belonging to the Spanish Ceramic Tile Manufacturers’ Association (ASCER), announces its schedule for Coverings 2018. Coverings, North America’s largest tile and stone exhibition, will be held May 8-11, 2018 in Atlanta, Georgia. 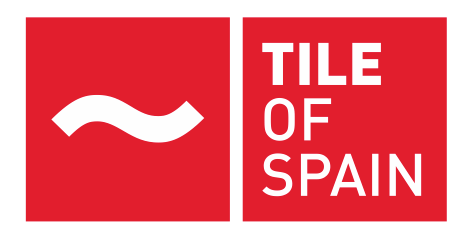 The Tile of Spain booth, #3718, which will be located in the center of the Spanish Pavilion, will feature educational seminars and video presentations, including award-winning architectural and design projects and an overview of Tile of Spain manufacturers’ achievements. Visitors to the Spanish Pavilion will witness some of the most advanced ceramic tile technology and breathtaking design choices the world has to offer from the 85 Spanish ceramic and stone manufacturers exhibiting at the show. A booth directory of Tile of Spain’s 85 exhibiting manufacturers’ can be found here. Join Tile of Spain pavilion as they dig deep into the broad array of micro tools that creative directors can employ to create the most effective and layered looks the world of ceramics has ever seen. Purchasers, sales-people, specifiers and end-users alike should all find valuable take-aways from this session by learning to distinguish the multiple layers of modern design and production techniques in ceramics. This session will reveal some key tips and tricks to getting the most out of tile in your buildings today. As a supplement to the conference session “Skin vs. System,” Tile of Spain will explore sales channels, specification practices and material selection models that can make the use of tile the single most important and impactful aspect of your next project. Join Tile of Spain for an extended happy hour and the opportunity to “Talk to the Expert” about tile specification, trends and more. The 2018 Spanish Pavilion is organized and sponsored by ASCER, the Professional Association of Ceramic Tile Manufacturers from Spain, and ICEX Spain Trade and Investment. For more information, email: info@tileofspainusa.com; or visit tileofspainusa.com.